Ever since Disney announced that it would add a Star Wars theme park to Disney World and Disneyland, fans have been waiting with bated breath to hear more about it. The curtain has finally lifted a little on the plans for Galaxy’s Edge, and we’ve got the scoop on what guests can expect. Buckle your seatbelts and prepare to launch into hyperdrive through this very detailed Disney adventure. Galaxy’s Edge will be set on a new planet in the Star Wars universe called Batuu. 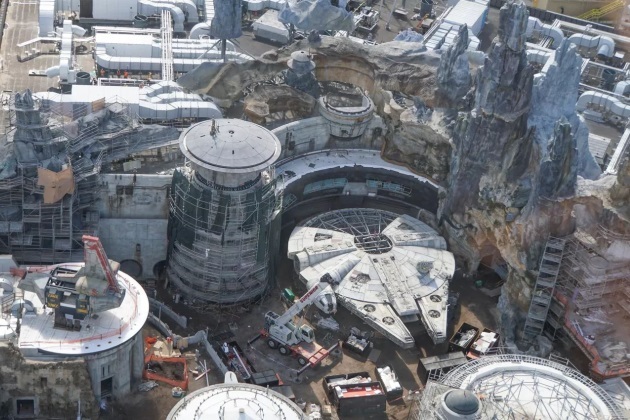 It will feature a village full of Star Wars-style architecture called Black Spire Outpost, a forest teeming with members of the Resistance in hiding, a life-sized replica of the Millennium Falcon, two impressive rides, three restaurants, and four specialty souvenir shops. Cast members will create their own in-park personas and will be dressed in authentic Star Wars clothes that they chose themselves from an array of design options. In addition to the rides and shopping, there will be interactive props spanning the park that guests can experience using their Disney Play app. Within the Disney Play app, guests will complete "jobs" by hacking into enemy systems, translating ancient text, and finding important spots around the park. The idea is to help entertain guests who will undoubtedly be stuck in line for the incredible rides for several hours. Star Wars: Galaxy’s Edge will have two immersive ride experiences. Have you ever dreamed of piloting the Millennium Falcon? Of course you have. Thanks to Disney, Star Wars fans will be able to make that fantasy a reality. To get in line for the ride, guests will zigzag through tunnels in a mountain range loading dock full of Star Wars artifacts and mechanics repairing other ships. Once you reach the control room for the Falcon, you will come face to face with an alien named Hondo Ohnaka: the smuggler doing the running and the second-most elaborate animatronic Disney’s Imagineers have ever created. Next, you will be led to the final waiting area: an interactive cabin inside of the Falcon. Everyone will have plenty of time to press buttons and take selfies before your group of six (two pilots, two gunners, and two flight engineers) is called in to pilot the Falcon. Each member of your flight group will have a critical role in your smuggling mission. The way you fly the ship and the accuracy of your shots at various targets will affect your experience on the ride itself. Rather than simply a ride, Disney describes Rise of the Resistance as a "cinematic experience." The premise is that once you jump in line, you are a new recruit for the Resistance on Batuu. The line winds through ancient Batuu ruins, where droids and Resistance tech await around every corner. Eventually you will bump into BB-8 himself, bearing a message from Rey. (Actress Daisy Ridley partnered with Disney to record an authentic hologram from her character.) Your wait in line is now over, and your adventure will begin. Cast members will rush your group down a cargo bay and into a transport ship for takeoff. However, this is still not where the actual ride begins. Your flight is interrupted when the cargo ship is captured by the First Order Star Destroyer. When the doors reopen, you will find yourself inside an enormous hangar aboard the destroyer complete with TIE Fighters and Storm Troopers. You and the rest of your fellow rebel scum will head to an interrogation room. Once you bust out of there, you will board a trackless cart and ride to your escape from the First Order. For vacation planning, it is important to note that Rise of the Resistance will not be available at either Star Wars park on opening day, but it will be open at both Disneyland and Disney World by the end of the year. Galaxy’s Edge will offer guests three opportunities to snack on galactic food. Star Wars super fans will appreciate the Blue Milk and Green Milk refreshments for sale at the Milk Stand. Grab your food and take a seat cafeteria-style inside Docking Bay 7 Food and Cargo, or sip on alcoholic beverages (a Disney parks first) at Oga’s Cantina. You can view pictures of the wacky snacks in this photo gallery from Entertainment Weekly. Unlike the rest of the Disney park zones, Galaxy’s Edge won’t contain any Disney-themed merchandise or even any Star Wars logo paraphernalia. All of the clothes and toys for sale inside Galaxy’s edge will look like something you would actually buy inside the Star Wars universe. You can purchase authentic Resistance gear or First Order uniforms in opposing clothing stores in different areas of the park. You can design your own custom lightsaber, or even take home a radio-controlled droid that will interact with elements of the theme park while you walk around. If you’ve ever wanted to cuddle with a Porg or any of the other Star Wars universe creatures, you can buy one that responds to your touch like a real animal. Take an inside look at some of the new Star Wars merch in this photo gallery from Entertainment Weekly. Star Wars: Galaxy’s Edge will open on May 31 at Disneyland and on August 29 at Disney World. Galaxy’s Edge will be located in the main Disneyland theme park in California, and it will be located in the Hollywood Studios park at Disney World in Florida. If you are planning a trip to either Disney Park this year, you might want to factor in the huge crowds that Galaxy’s Edge will draw when it first opens. It is also important to remember that neither park will have access to the Rise of the Resistance ride on opening day. Special reservations are required to access Galaxy’s Edge in Disneyland when it first opens, from May 31 – June 23. The newest addition to the two beloved Disney Parks is sure to delight Star Wars fans everywhere. You may find yourself murmuring "I love you" as you wander through the Galaxy’s Edge gates. And trust me, Disney knows. Julie Anne Wells is a professional copywriter and former local journalist. She is the founder of Live Love Local, a blog dedicated to spotlighting local businesses and events in her home city of Dallas and beyond. You can connect with her on LinkedIn or read more of her adventures at LiveLoveLocalBlog.com.